Dopplr - the great and cool travel social network - has an obsession with traveling by plane, that I cannot share. Since they started recording the means of transportation for a trip (by car, by train, by plane, ... on foot) to calculate your carbon footprint, the default setting is "by plane" no matter what the trip. Even for a trip that is only 200km... or less. 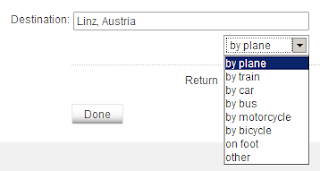 When you tweet or email a trip, dopplr does not even parse a string like "by car" - which would be easy to parse, given the clear and narrow dictionary "by plan", "by train", "by car", "by bus", ..., "on foot". One could really look for those strings literally.